The 2019 Hastings Deering Colts season is just a few months away and the clubs are already back into pre-season training. As we get them, we’ll post all the club’s squads for the upcoming season. Please bear in mind, that many of these squads are summer squads and contain a number of Mal Meninga Cup players and trialists. Players in bold played Hastings Deering Colts in 2018. Braden Amundsen, Tom Berkers, Cameron Brown, Jayden Campbell, Josh Caruana, Patrick Clark, Reegan Creedy, Alex Drewe, Shallin Fuller, Oshae Hannaway, Jayden Heta, Leighmon Hohaia-Katene, Latrell Howe, Allan Lockwood, Luke Maiden, Zac McCormack, Tyrin Ona-Murphy, Caleb Pirini, Zane Prophet, Will Ramsey, Ronin Rio, George Santos-Motuapuka, Keaston Schmidt, Andrew Scougall, Ignatius Sefo, Daniel Shannon, Jayden Sharp, Lochlyn Sheldon, Jock Sullivan, Tyler Szepanowski, Reece Tapine, Larryon Tevita, Lane Ticehurst, Xavier Toia, Taine Tuaupiki, Ben Willets, Mikey Williams, Brayden Young. Cosi Auina, Ben Bale, Bailey Bartley, Jared Chambers, Chad Dowling, Solomona Faataape, Brandon Frescon, Nathan Geno, Joel Hughes, Rhys Jones, Lathan Joseph, Tom Kenny, PJ Lokise, William McPherson, Christian Mikaele, Jacob Munro, Dray Ngatuere-Wroe, James Price, Blake Pyle, Tom Reid, Luke Self, Jake Shaw, Isaac Skyring, Jumon Suilai, Dario Takitaki, Zac Teevan, Tyrone Titasey, John Vairoa, Dom Wynyard Te Awa. 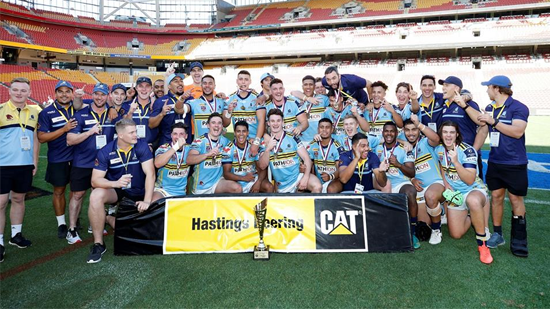 Thomas Banu, Beau Berg, Simon Bevan, Jeremiah Bowen, Lyle Bowie, Damien Burke, Joshtel Charlie, Eli Dionysius, Jayden Edwards, Billy Flynn, Usaia Fonongaloa, Connor Gowans, Liam Heidemann, Adam Hepworth, Tamati Huirama, Brandon Jackonia, Zane Knowles, Daniel Lazarus, Simon Mae Mani, Jarom Mairu, Robert Maxwell, Tom McGrath, Tazmon McRobbie, Herani Meremere, Ewan Moore, Zac Mossman, Jack Myatt, Jimmy Ngutlik, Marcus Nona, Tyson Phineasa, Jonah Rameka, Mark Rosendale, Connor Rothery, Colt Salmond, Steven Stafford, Chase Taia, Sky Tereora, Matthew Whybird. Nathaniel Barbagallo, Steven Borg, Hunter Brough, Dylan Carolan, Mateus Chankay, Khai Currie, Thomas Dwan, Nic Edwards, Nick Ellems, Zac Green, Kane Jackson, Tye James, Rowan Jardine, Mathew Kidd, Gian Largiader, Justin Makirere, John McLaughlin, Luke Murtagh, Aaron Nelson, Jaylen Nom, Wyatt Reynolds, Ryan Sauer, Cameron Saunders, Tyson Smoothy, Jacob Tompkins, Keaton Walkington-Meade, Kyle Waller, Lincon Wikaira, Blake Wilson, Jack Wright. Lachlan Buchanan, David Butler, Jack Callow, Xavier Fletcher, Tausaga Foai, Shannon Gardiner, Chris Humphris, Caleb Ika, Liam Jones, Carlos Knox, Jacson Lott, Nofoasa Malutoa, Will McAuliffe, Ryan O’Keefe, Ami Palelei, Logan Pengelly, Lachlan Perry, Peter Pritchard, Blake Pyle, David Quinlan, Brock Richardson, James Robinson, James Steen, Jalen Tagiiti-Turner, Sione To’a, Kenshin Tsutsui, Isaac Wallace, Zane Wallace, Tana Whakatau.